It’s been going on for generations. Yes, the Mercedes-Benz S-Class and the BMW 7 Series have been engaged in a battle at the top of Technology Mountain for a relative age. Each time one of the full-size luxury sedans lands an innovation-laden punch, the other responds with a stinging “first” of its own. Think back and you’ll see what we mean. The pre-emptive safety systems that are common in premium cars today have the W220 S-Class to thank for their existence. The original 7 Series, meanwhile, was the first car to come fitted with an electronic speedometer. Yes, both German automakers have long used their flagship sedans to debut innovations that eventually trickle down to “ordinary” cars. And, since we’ve just spent a little time getting to know the sixth generation of the BMW 7 Series, we thought we’d look at exactly how this latest version of the luxury barge from Munich attempts to get one over its Stuttgart counterpart. Keys are for nothing more than locking, unlocking, and starting your car, right? Well, not anymore. 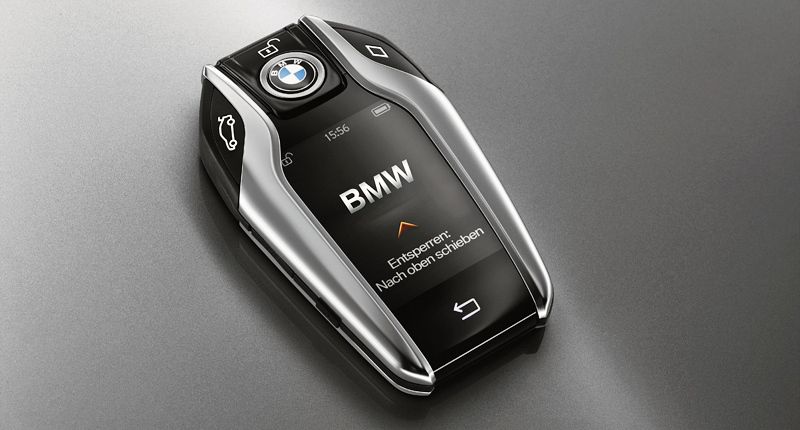 The BMW Display Key that comes will the new 7 Series does a fair job of mimicking a tiny smartphone, complete with a 2.2-inch LCD touchscreen with a resolution of 320×240 pixels. The nifty key-fob displays information such as driving range and fuel level, and also allows the user to remotely lock doors and close windows. It also facilitates control of the heating and climate functions, effectively permitting the preconditioning of the vehicle’s cabin (within a range of around 275 metres). 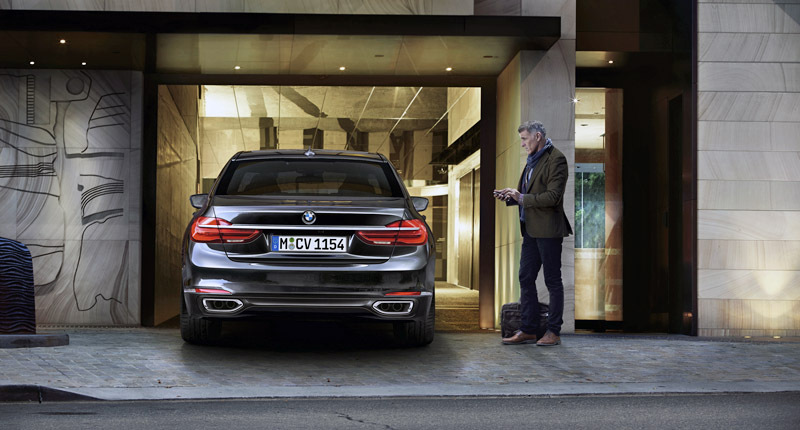 Yes, the latest BMW 7 Series is the first production car in the world that can be manoeuvred into and out of forward parking or garage spaces without anyone sitting inside the vehicle. The Remote Control Parking system is activated by the driver from outside the vehicle using the BMW Display Key (see above), prompting it to perform the move semi-autonomously. The vehicle moves forward when entering the space, while the exit manoeuvre is performed in reverse. Of course, there are some things to keep in mind. While parking is taking place, for instance, the driver must watch out for obstructions and, if necessary, bring the vehicle to a controlled stop. In addition, the function can only be activated when the vehicle is positioned centrally in front of the selected parking space. And the distance the Seven is allowed to travel in driverless mode is limited to just 1.5 times the length of the vehicle. No, flipping the bird at another motorist won’t result in your 7 Series honking its horn, flashing its lights, or running your foe clear off the road. But you can perform simple tasks such as rejecting an incoming call with a mere swipe of the hand. Perhaps the most useful function is that of volume control. By twirling a finger in the air, the user can adjust the audio system’s volume up or down in an entirely intuitive manner. 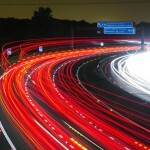 It works well, although there is sometimes a little bit of lag to deal with. The system works off a 3D sensor, which is capable of detecting a few pre-selected hand movements. In addition to the basic functions outlined above, users can also customise the two-fingered gesture (no, not that one) to perform tasks such as skipping to the next track or navigating home. The BMW i8 plug-in hybrid sports-car was the world’s first production vehicle to be available with laser headlights. 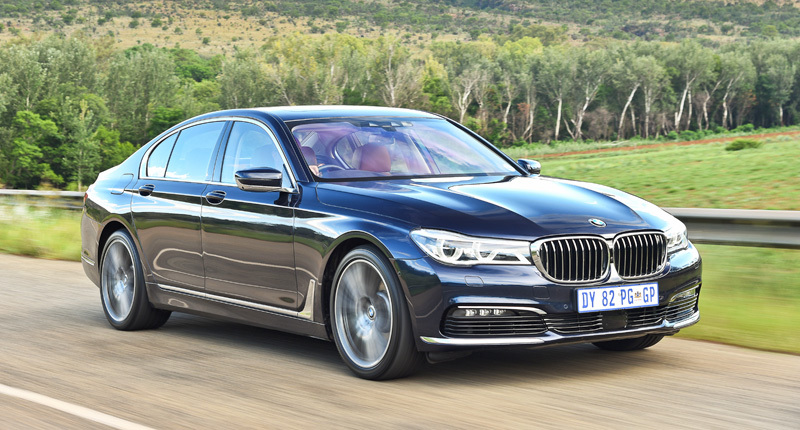 But now the 7 Series can be had with the German brand’s Laserlight technology, too – and it beats the S-Class (and every other segment rival) to the punch. An optional extra to replace the vehicle’s standard full-LED headlights, the laser headlamps generate a bright, pure white light, with the high-beam range doubling to a useful 600 metres. They feature blue design accents, as well as “BMW Laserlight” lettering. 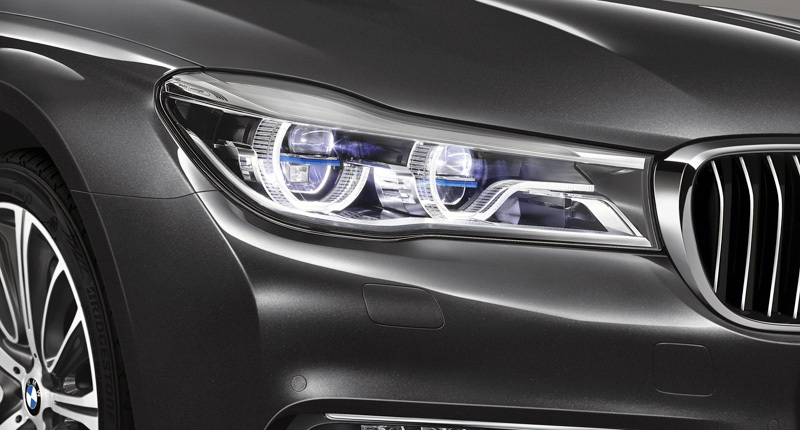 The headlights also employ a selective beam system that ensures the drivers of oncoming vehicles aren’t blinded by your super-expensive laser headlights. And, of course, the system also features “directional” beams that light up all the right parts of upcoming curves. Carbon-fibre was not long ago reserved for only the most exotic of sports-cars. 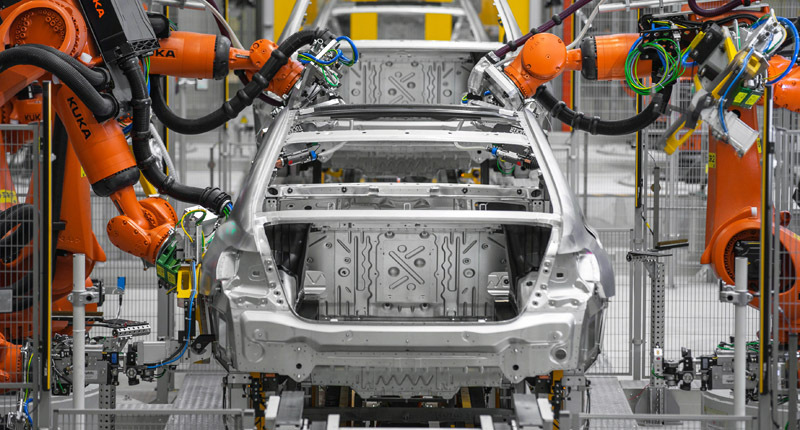 But the lightweight material is becoming more and more common in other segments, and is used extensively in the BMW i3 and i8, too. For the 7 Series, however, BMW’s engineers have created something they call a Carbon Core. Essentially, this body design uses a composite construction featuring carbon-fibre reinforced plastic (CFRP), ultra-high-strength tensile steel, and aluminium – making it the first vehicle in which industrially manufactured CFRP is used together with these two other materials.